A student asked a most intelligent and difficult question during a recent workshop: How do I continue to be creative with subjects or locations I’ve photographed many times already? Every artist, I think, faces this ongoing challenge of paving new ground over worn turf. After all, if it worked once before, why not see if there’s more water from that same well? This week’s photograph illustrates two very useful approaches to overcoming creative doldrums. Call them mind and body calisthenics. This is a photograph of part of a lupine flower, though not a typical rendering of the purple and magenta blossoms which joyfully color the Israeli landscape each spring. Instead, I allowed my mind and my eyes to drift past my expectations in search of something new, something which if described to you with only words, you’d be suspect to consider photographing. The second trick in stretching one’s creativity is getting out under varying and often adverse conditions, such as on a day when steady rain kept the landscape damp and dewy. 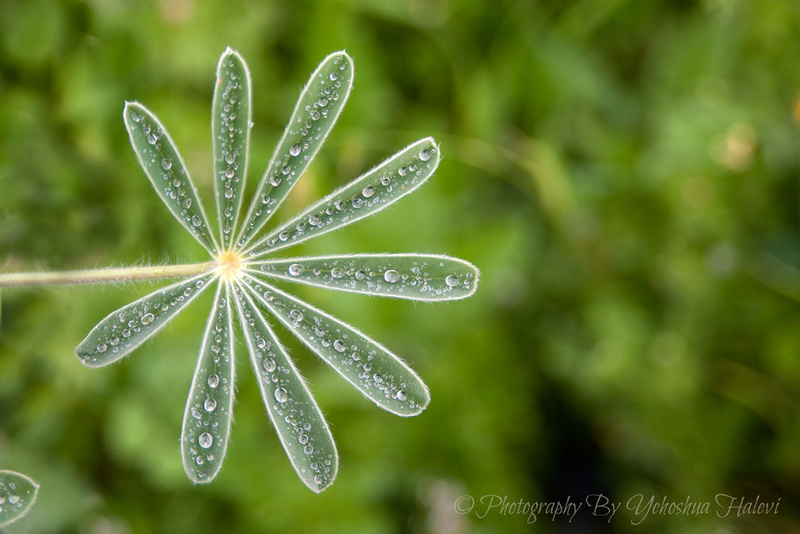 I found a leaf stem balanced parallel to the ground, hirsute and gently cupped to hold perfect beads of water. I prepared for the weather, donning waterproof boots and a rain slicker and found old friends dressed anew and putting on a good show. Wishing all of Am Yisrael a Chag Kasher U’Sameach! Happy Passover. Join my Advanced Digital Photography Course. Free preview session on Monday, May 2 in Jerusalem. Click here for more details and to register for the introductory session. TECHNICAL DATA:Camera: Nikon D700, handheld, aperture priority exposure, matrix metering mode, f/4.5 at 1/320 sec., ISO 800. Raw file converted to Jpeg. Lens: Nikon 28-105 macro zoom at 85mm. Date: Feb. 15, 2015, 3:08 p.m. Location: Ela Valley, Central Israel.